The Songs Of Protest Return. Prince performed in Baltimore this weekend and wrote a song for the protest & #BlackLivesMatter movement that has been growing over the last 6 months. While we’ve seen EDM remain largely a-political, hip hop artists have taken up the call to speak truth to power through their rhymes. In addition to Prince’s track, I wanted to highlight some of the other artists that have touched on the issues of brutality & freedom in the last couple of months. One of the first to be released on YouTube was this one, posted in December of 2014 by The Peace Poets. 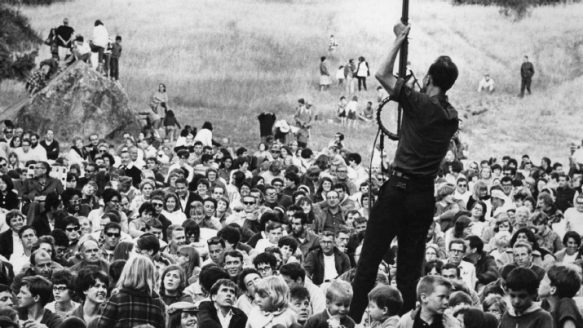 This is a more traditional peace/protest song than the other songs on this list, in the same vein as many of the Vietnam anti-war protest songs done by Pete Seeger (pictured above). Alicia Keys released a track in early December as well. One of the first top tier artists to mention this publicly, she was definitely wading into heated ground. Her soulful “We Gotta Pray” is accompanied by stunning images & history lessons about the struggle for equality that many have faced in America. I hope to never see him on the back of a t-shirt. I hope no man in uniform assumes he’s reaching for something in his pocket. I hope he knows it’s ok to love. Peter $un has been making waves in VA and clearly, with sample & flow like this, you can tell why. This guy needs an audience with Chance The Rapper immediately. He talks about fears in the same way Malik Shakur does, especially bringing in his concern for his daughters & nieces. It’s not just men who feel like they’re threatened, many women have been the victim of violence at the hands of authorities. Peter $un gets some help from Matt Burton, in the form of some stupendous beats. They’re low, lazy but original, bubbling up to back Peter while he oozes lyrical cleverness & fear for his community. Not sure what else needs to be said about The Blacker The Berry. Kendrick Lamar‘s anthem (one of many) has a perfect way of pulling things out of you that you didn’t know you had inside of you. His embrace of his identity & his challenge against the establishment is clear, if not terrifying for those who can’t identify with his words. While there have been many songs that speak of peace, Kendrick Lamar’s track evoked pain & deep frustration with the status quo, even as an insanely successful artist. I’m rounding out with a totally new track off of DVS’ new mixtape that really swings for the fences on this. This is a hard feel matched with some of the most profoundly effective flow this side of the planet. DVS discusses the rage that you see on the faces of so many of our downtrodden and exploited. He brings up the specific/crucial point if treating children like criminals while they’re still in school, which then translates to the way they’re treated by law enforcement. DVS legit drops a line or two from Howl (yes, the one by Ginsberg), just in case you didn’t realize just how advanced his skills are. This may not have been created specifically to respond to the deaths of Garner, Gray or Brown, but DVS speaks of the issues in ways many other rappers seem to have forgotten. Show all these folks love, they deserve it. Hug your loved ones, help your community & help us build a better tomorrow. This entry was posted in Long Form and tagged Alicia Keys, Baltimore, Black Lives Matter, Ferguson, hip hop, Kendrick Lamar, Prince, Raury. Bookmark the permalink.